NEWS REPORT: Handball streaming platform enters the new season with a new facelift and a rich offer of top class matches. 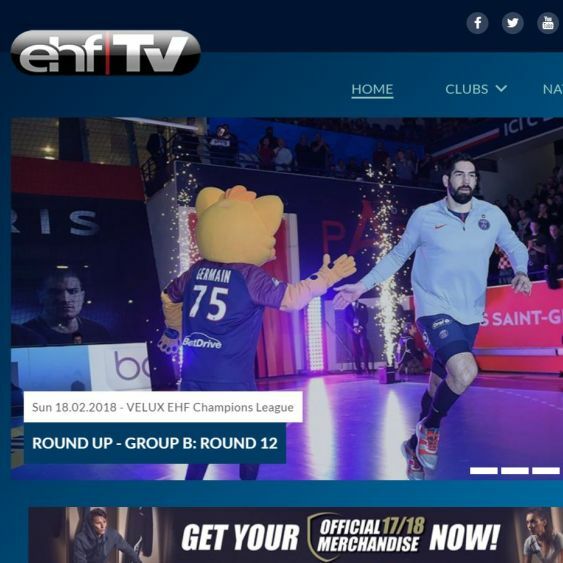 Handball’s leading live streaming platform – ehfTV.com – has been given a new look just as the club season in Europe nears its climax. Apart from general small graphical updates on the whole platform new features for viewers include live-stream multiview, which enables viewers to watch up to four live streams simultaneously or the floating player, which gives the visitors an opportunity to discover other content of the platform while watching live games. These features will be greatly appreciated by the fans who can follow more matches at the same time already in the upcoming weekend with a lot of games in the VELUX EHF Champions League, Women's EHF Champions League or the Men's EHF Cup being played at the same or colliding time. In addition player timeline thumbnails have been added alongside the watch later functionality, which can be used to save videos and watch them later and video progress storage function, which jumps into the point where the user has stopped watching the video. ehfTV is the longest serving OTT handball platform. The first match was streamed already more than 10 years ago, back in 2007. Every single match in both the VELUX EHF Champions League and Women’s EHF Champions League as well as video clips and news and ‘REWIND – The Handball Show’ are available for fans worldwide to watch online. Also available are numerous matches from other European club or national teams competitions or games from several domestic leagues.